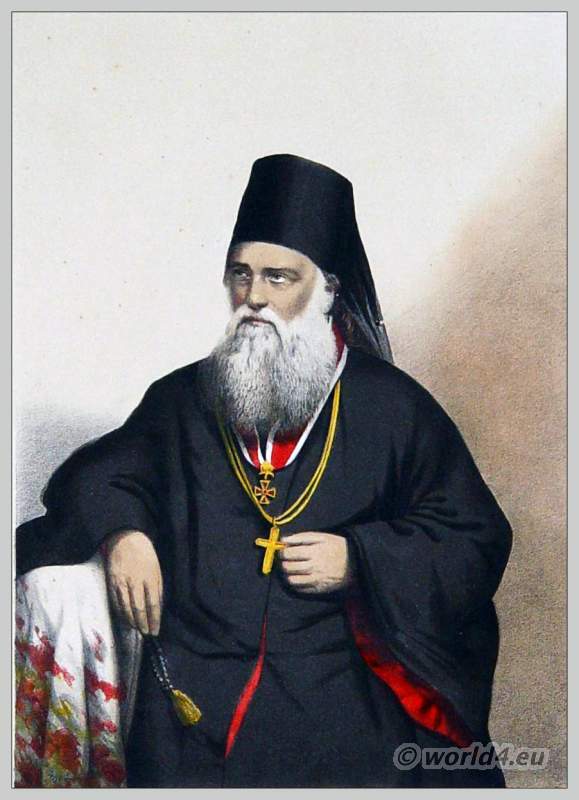 Greek bishop dressed in a Rhason (Rhason the word in Greek means “used, worn garment.”). The Rhason is wider than the Talar has long sleeves and is usually black. If the priest is preparing for the liturgy, he puts the Rhason and pulls on the robe, the tunic, the alb, the other about to vestments. Talar and Rhason mean symbolically renouncing all earthly vanity and striving for spiritual peace. The vestments of the clergy are therefore black, because they mean the penance and the utter peace that should reign in their souls, the absence of turmoil of passion, the renunciation of all earthly vanity and a focus on the inner life. On the feast and memorial days of the martyrs is the color of ornate red as a sign of faith in the shed blood of Christ. The Kamilavkion is cylindrical in shape and black in the Churches of Greek tradition and for non-monks with a brim, while monks – and thus also always the monk as belonging to bishops – wear on formal occasions over the Kamilavkion with a backwards falling veil (Greek epinokamilvchion) which is in the Russian tradition usually associated with the fixed Kamilavkion and is not removed. She was originally part of the Byzantine crown and was adopted after the fall of Byzantium by the Orthodox Church. It had the task to cover the bare neck of the Byzantine emperor, because the neck showed only subjugated. This entry was posted in 1857, Ancient Greece, Ecclesiastical, Headdresses and tagged Ecclesiastical Dress, Monastic clothing on 9/9/13 by world4.